I am a firefighter and shortly after 911 the Girl Scouts or some other group brought little flag ribbons to our station. Attached to the ribbon was the name of one of the 343 with a one sentence description of them. They passed the individual ribbons out to our personnel to remember the fallen FDNY firefighers. Mine was David Arce. I took mine and attached it to the sunvisor of my staff car. 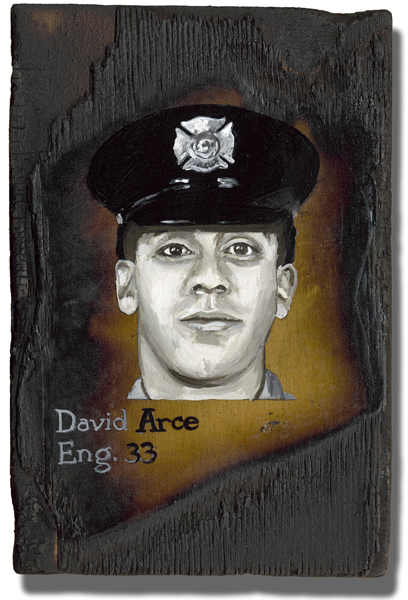 I see it all the time and I haven’t forgotten Firefigher Arce. Every time I go to work, go to a meeting or answer a call, David rides with me. Until today though, he was a name. Thanks to this project I now see a face. I’ve printed it, cut it out, and clipped it to the ribbon. Thank you for introducing David to me. I think I’ll take him out to lunch.